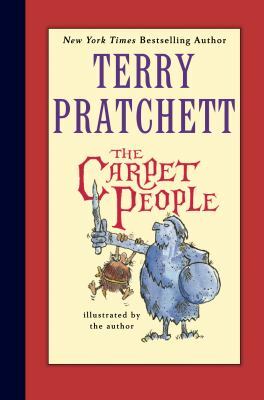 Posted on April 18, 2014	by Katy K.
The Carpet People by Terry Pratchett. Clarion Books, 2013. Originally published in the UK by Colin Smythe, 1971. Terry Pratchett charmingly says in the introduction that his first book was finally reissued because the publisher got tired of telling people that it was out of print because there was no interest in it. The story involves warring tribes of microscopic people for whom the carpet is the entire universe. Individual fibers are the size of trees (and often bear fruit); there is a whole industry built around the mining of varnish from a nearby chair leg to be made into all sorts of products. As the story opens, the Munrung Tribe has just learned that the dreaded Fray is making inroads into the Carpet. Our guy Snibril, younger brother to the clan leader, Glurk, and their shaman Pismire, lead the tribe off to the great empire city of Ware to see what can be done about this. Along the way they find villages and cities under attack from fearsome creatures, the mouls, who seem to want to take over the entire Carpet. There are also meetings with the mysterious and elusive tribe who always know what’s going to happen before it does. Pratchett’s original line drawings are both very funny, and helpful for illustrating the bizarre creatures and things that make up the Carpet. It’s a cute concept made into a fairly standard quest narrative, with thoughts on free will and empire that show the beginnings of that depth-behind-humor that we know and love Pratchett for. Maybe it was just me, but the cast was large enough that I had trouble keeping track of everyone. I still prefer The Wee Free Men as a kid’s first introduction to Pratchett, but Pratchett not quite grown into his full writing strength is still worth reading. This entry was posted in Books and tagged quest fantasy, Terry Pratchett, youth fantasy. Bookmark the permalink. A very fun review! I’ll keep this one on my radar when I’m seeking some Pratchett-esque storytelling.